Does new icarscan conclued 5 cars and 5 special functions? I’ve gone to the ICARSCAN page supplied by the seller and of course I’m more confused than ever. It says 10 downloads, does that mean 5 cars and 5 special functions? Here is a brief introduction of special functions in the main menu and that under a model. If users choose special functions in the main menu and select one, then users can perform this function for all models developed in the list. 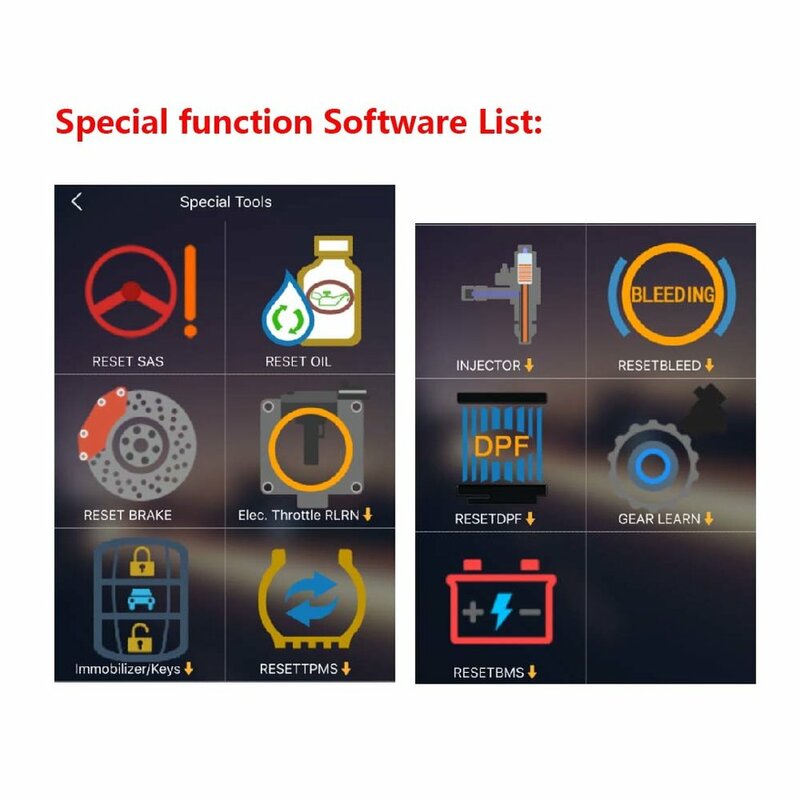 For example, users go to Special Functions in the main menu for oil reset, they can reset oil for all cars listed there like BMW, Toyota, Honda and cannot go to diagnosis or others. Does that mean if you pick oil reset under the main menu it is a function of all cars listed, but if you don’t pick it you can maybe find it under a specific car brand? 2. I’d be willing to try the key function in hopes it will work with some car on my list. 3.What does the Battery MS one do? 4. What is the difference between Bleeding and rest brake? you can pick any 10 you want. 10 car brands or 3 special functions and 7 car brands etc. whatever adds up to 10. I have an iPhone and had to choose all 10 at the start. Tried selecting just porsche and then continuing. Wouldn?t let me do it. The Porsche specific one resets oil and tons of other stuff. That?s what I used for my reset yesterday. Next time I?ll try the special function to see if it works the same.